For some in Westeros, the world ends at the Wall. Nothing lies beyond it but death. However, there are people who inhabit those lands. They are known as Wildlings to those unfamiliar with them, but they call themselves the Free Folk. Mostly consisting of loose tribes and clans, the Free Folk may seem like a scattered people, but when the call to war is sounded, they band together and form a unique and deadly force on the battlefield. 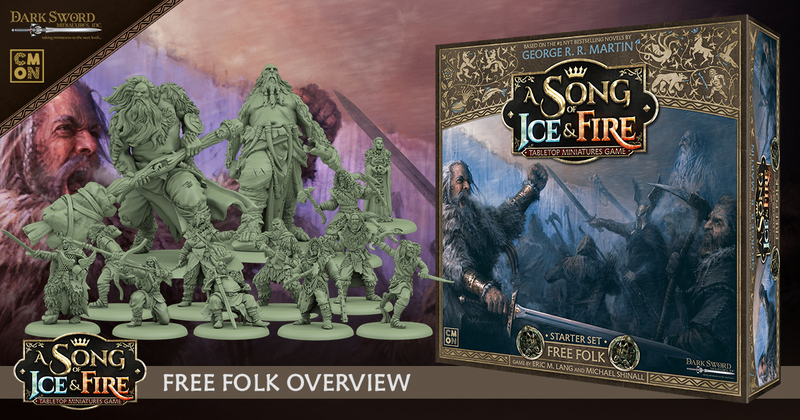 The Free Folk Starter Set for A Song of Ice and Fire: Tabletop Miniatures Game brings an entirely new play-experience to the table, both when fielding them and fighting against them. Unlike the armies of Westeros, those who live north of The Wall do not have the militant training of crowns and kings, instead gaining a ferocity cultivated by the very environment they live in. Superior Numbers: The Free Folk can field more Combat Units than any other army, primarily due to the fact that being an untrained and motley assortment, none of their units are much of a threat individually. The standard Free Folk Raider unit comes in at a meager 3 points each. Of course, one should never dismiss them just because they don’t have the fancy steel or tactics of the southerners. They more than make up for that in bulk numbers! Overwhelm and Overcome: When it comes to Tactics Cards, the Free Folk specialize in using their numbers to their advantage. Cards like Group Assault will grant your units powerful boosts in combat (in this case, both Sundering and Critical Blow) when ganging-up on enemies. Meanwhile, their arsenal also includes de-buffing effects like There’s Too Many! And Distraction Tactics, which act to cause severe combat disadvantages and Panic-inducing effects to enemies, bringing them down to the Free Folk’s levels. Strike Hard and Fast: Speed is also an important element of the Free Folk army. Their primary Tactic Zone is the Maneuver Zone, which should be taken (or denied, if playing against Free Folk) whenever possible. The Free Folk want to position themselves to get those group assaults off, and a variety of speed-boosts, including the Swift Advance Tactic Card, help them achieve this. It’s not merely their Tactics Cards that assist here. Their unit attachments, such as the Raid Leader, grant options as well. Raider Leaders allow the Free Folk to chain Combat Unit activations together, truly recreating the feeling of a massive horde advancing on their prey! Of course, these are merely the basics of the Free Folk. Another factor to consider is their ability to field Giants, whom strictly go against the “cheap horde” style of the rest of the army. Utilizing these immensely powerful (but also expensive) options can give their army just the punch it needs to deal with the innate weaknesses of the cheaper units (that being enemies with superior armor and defense). Finding the right mix of expensive, powerful units and cheaper swarm-units will depend on a Commander’s preferred play-style. But regardless of the outcome, the Free Folk will play unlike any army yet seen on the fields of Westeros!